2010 August 10 » Change Myself. Change the World. For the lift, 140 was a personal record! For the workout, my burpees are relatively slow so I really tried to book it on the lunges which worked well. The less time I spend with weight over my head the better off I am. I did not rest so I was happy with my time. But I let Rosanne know that I fully expected her go faster. Not only did she accept the challenge but she did it in under 7 minutes! What a stud! I have set a new goal for my 20 days of Paleo/Zone. No two dinners will be alike. This will force me to use a variety of healthy recipes to make sure I don’t get stuck in a rut of eating the same thing every night. 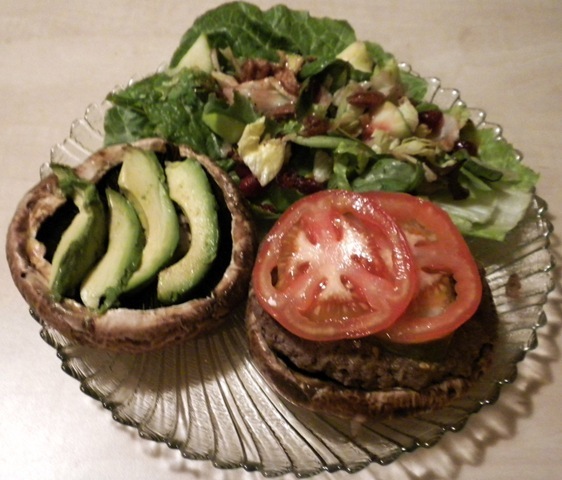 Tonight I made a bison burger and used portabella mushrooms as a bun. Mmmm. (Sorry, I didn’t measure anything. I just guessed). You can warm up the mushroom “buns” on the grill, the stove, but they seem to come out best when you toast them in the convection oven. They get warm all the way through without getting soggy. The tops dry out so they are not too slippery to pick it up like a burger. (Avocado tastes good with this I put some on my burger so I left it out).